Tully No.5, Walkers B-B DH 650 of 1970 (rebuilt by Walkers in 1993) shortly after entering service at Tully Mill, July 1993. Queensland in Australia is where you can find the world's most exciting variety of modern narrow gauge railway systems [nineteen 610mm (2ft) gauge and one 1067mm (3ft 6ins) gauge] that connect sugar mills with the surrounding areas where sugar cane is grown. 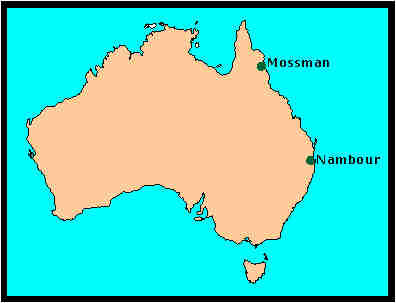 The sugar mills are to be found in a 1430 km coastal strip from Childers in the south to Mossman in the north. The job of the railway systems is to transport the freshly harvested cane to the sugar mill for processing as soon as possible, preferably within 12-18 hours and definitely within 24 hours. The work goes on 24 hours a day and in most cases 7 days a week during the crushing season which runs for around 20 weeks or so each year. The operation of the cane railway (often referred to as "tramway") is basically very simple. Each locomotive collects a rake of "bins" from the empty yard at the mill and delivers them to various loading points on its run. It normally runs cab first with empty bins, a practice dating back to steam days. The loading points take the form of sidings where the bins are stored while waiting to be filled by cane farmers or harvesting contractors. On its return run, the locomotive picks up full bins from the various delivery points and hauls its train to the mill, delivering them to the full yard. From there, the bins are automatically taken through the weighbridge to the tippler where the cane is emptied, entering the mill for processing. The empty bins proceed to the empty yard for the cycle to be repeated. It takes about 8 tonnes of cane to produce one tonne of raw sugar. There are generally three 8-hour shifts for the locomotive crews, but the majority of harvesting takes place during daylight hours and part of the role of the cane railway is to smooth out the supply of cane to the mill over a 24-hour period. At each mill, a traffic officer is responsible for the allocation of the bins to the various loading points, depending on the areas where cane is being harvested. This process works under a more general scheduling system, which is developed using computer software. 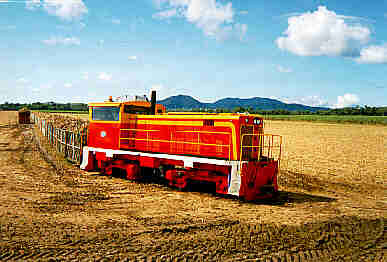 Computer scheduling optimises the use of locomotives and rolling stock in ensuring that the cane can be brought to the mill in the most efficient manner possible. Starting from the north, the sugar mills are listed showing the road distance from Brisbane, the State's capital in the south-east corner. The scale of these railways is remarkable. There are about 4,000 kilometres of track, of which about 3,000 kilometres is main line, transporting up to 36 million tonnes of sugar cane each season. There are about 250 diesel hydraulic locomotives in use and about 52,000 cane "bins", both four-wheel and bogie, are used to transport the chopped cane during the crushing season of up to 26 weeks. The season normally runs from about June/July to November/December. Locomotives of up to 520 kilowatts power are in use, with numbers of them converted to 610 mm (2 ft) gauge from 1067 mm (3 ft 6 in) and even standard gauge. The furthest run to a mill is 119 km and the average distance hauled ranges up to 35 km. Trains can run at 40 km/h and can be up to 2000 tonnes in weight and one kilometre in length. Pioneer Mill is the only mill with a 1067 mm (3 ft 6 in) gauge rail system. It is believed that it will eventually be converted to 610 mm (2 ft) gauge, and currently shares about 25 km of dual gauge track with its two neighbours. 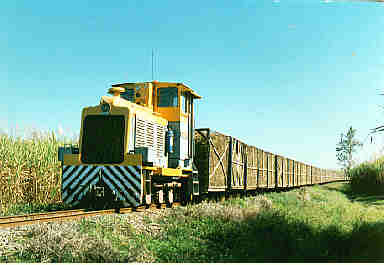 A number of mills (three in Queensland, three in New South Wales and one in Western Australia) do not have railway systems and rely on road transport for cane deliveries. Some mills with rail systems rely on road transport for the delivery of a proportion of their cane. However it is recognised that rail transport is the most economical transport method where tonnages are sufficient. The sugar mills' operating rail systems are owned directly or indirectly by public companies listed on the stock exchange, or by private companies which are actually or effectively farmers' co-operatives. In addition, both Kalamia and Invicta Mills are connected by dual gauge track over a lengthy section of Pioneer Mill rail line. Macknade Mills 18 (Clyde 0-6-0DH DHI.5 of 1954) with 144 bins from Tara having just crossed the QGR line near Bemerside. There are many attractive features of these lines which make them of great interest. The majority of locomotives are 0-6-0DH or B-B DH types, ranging from 15 tonnes to 40 tonnes. There is also an interesting variety of smaller locomotives used for yard shunting or track maintenance duties as well as cane haulage. Since 1954, almost all locomotives have been manufactured in Australia. Numbers of the older 0-6-0DH locomotives have been fitted for multiple-unit use to enable them to run paired with a single crew. 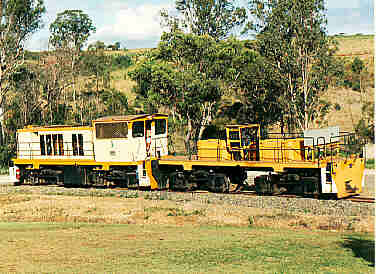 From 1991, all "new" locomotives have been rebuilt from ex-Government Railway B-B DH machines originally built by Walkers of Maryborough and regauged from 1067mm gauge (Queensland Railways DH Class and Westrail's M and MA classes) and 1435mm gauge (New South Wales State Rail's 73 class). Numbers of these locomotives are in storage awaiting conversion. Invicta Mills Walkers B-B DH Clare (655 of 1970, rebuilt Tulk Goninan, 1994) approaches the mill after crossing the Haughton River, 10 October, 1996. Locomotives are usually crewed by a driver and by a "fireman" (once known as a "points boy"). The fireman's job is to count and record bins, couple and uncouple, to change points and hold down catchpoints, and to assist the driver with shunting operations. Hand signals were once the main method of communication when shunting, but at some mills, two-way radios are now issued to assist communication between driver and fireman. A number of locomotives have now been converted to one-man operation. These are referred to as “remote shunting units” (RSUs) as the driver can use a hand-held remote control device to enable him/her to carry out shunting operations from outside the locomotive cab. Rolling stock consists largely of cane "bins" which are box-like containers on wheels, often constructed from tubular steel with wire mesh sides. These vary in capacity from 4 tonnes to 14 tonnes. Four-wheel bins range up to 10 tonne capacity, while bogie designs are used for larger types. Couplings range through hook & chain, link & pin, a ball and socket type coupling, and miniature Willison automatic couplers. Until recently, four-wheel cane bins were only built up to six tonne capacity because they were generally taken from the line on rubber-tyred infield transport vehicles for filling by the cane harvester. During the 1990s, specialised infield elevator-tipper rubber-tyred vehicles were developed which are capable of loading the bins at the siding and enabling larger bins to be introduced. Two mills transport raw sugar by rail to the local port. 11-tonne bogie sugar "boxes" are used by Victoria and Macknade Mills to take raw sugar to the Lucinda Bulk Sugar Terminal. Walkers B-B DH 605 of 1969 with brake wagon and sugar boxes at Victoria Mill, August 1991. This is an ex QGR 1,067 mm gauge locomotive converted to 610 mm gauge. There is a variety of specialised rolling stock such as ballast hoppers, rail bogies, air compressor and tool wagons, and mess vans which can be observed being used by the track maintenance workers (navvies) or more likely parked around the mill yard. There are also a few motorised line cars to be seen. 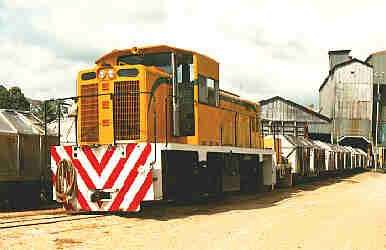 CSRs Herbert River Mills' Plasser GWS 75 spot tamper (434 of 1997), which is seen here at Macknade Mill, 29 May 1997. 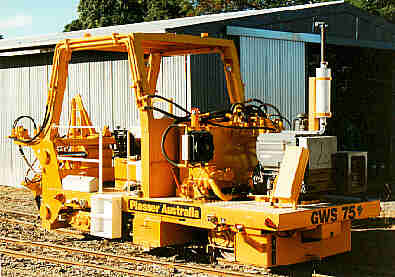 Specialised self-propelled mechanised track maintenance equipment includes ballast tampers, ballast regulators, sleeper replacement machines, and track jacks. Mills have constructed some marvellous examples of vehicles for track work including a track building machine (for prefabricated track), a bridge girder lifting crane (which has a massive counterweight and can only run on straight track), and a vehicle which enables bridge piers to be replaced by supporting the pair of bridge girders on either side of the affected pier. Ballast ploughs have been constructed from old locomotive frames and there is a fascinating variety of anti-weed devices: powdered and liquid herbicide spreaders, and rail-mounted slashers. Rail in use is almost invariably 31 kg/m (60 lb/yd) on main lines and 22 kg/m (40 lbyd) on branch lines and sidings. Concrete sleepers are widely used, although steel and timber sleepers are also to be found. 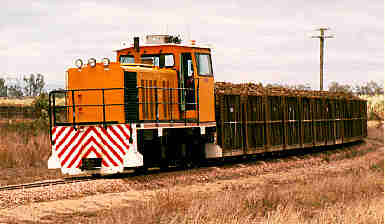 Long-welded rails are in use at some mills, and stone ballast is commonly used. However, many of the mills are in high rainfall areas and at places where flooding is common, cheaper materials are used for ballasting. There are a number of long and high bridges which provide good photographic opportunities. There are still timber trestle bridges to be seen, but these are being gradually replaced by steel and concrete. One mill has a couple of river bridges with lifting spans, while another has a 280 m tunnel. Steep grades can be encountered on some systems and there are some heavy earthworks, the most spectacular being a long 30 m deep cutting. Trains are not continually braked so to assist with the control of the loaded rake, radio-controlled brake wagons (usually referred to as “brake vans” within the industry) were developed. Brake wagons are attached to the end of the loaded rake. The first examples were built on a rigid 6-wheel locomotive type frame but nowadays, a bogie design is used. These vehicles carry an air compressor and the brakes can be applied by remote control from the locomotive cab. DH class contrasts: 610 mm gauge Walkers B- B DH ISIS No. 1 (602 of 1969) together with its brake wagon, itself built on the chassis of a Walkers B-B DH (654 of 1970). 17 October 1997. The next step was the locomotive fitted out for “slave” operation. A "locotrol" system was developed to enable a second locomotive to be placed about two-thirds of the way down the rake, remotely controlled by radio from the lead locomotive's cab. This system is in use at a number of mills where heavy trains need to be hauled over long distances over hilly country. Some locomotives have been modified as "remote shunting units" designed for one-man operation, and can be driven remotely for shunting operations, using a hand-held radio console. There is no comprehensive system of safe-working on cane railways. Train control is effected using two-way radio to communicate between the mill's traffic officer and the locomotive crews. The radio also allows the crews of individual locomotives to communicate with each other. A variety of techniques are used to assist with traffic control including satellite technology for locating the position of locomotives, and a block system where locomotive drivers must radio the traffic officer before crossing particular control points on the system. More sophisticated types of real time displays of train movements in the traffic office, rigorous systems of ensuring that verbal instructions are correctly understood and logged, and a variety of automatic warning systems increase rail safety. Signalling is generally confined to point indicators and the use of colour light signals to assist drivers when entering the full yard at the mill. There are many crossings of the 1,067 mm gauge tracks of the Queensland Railways, and in many of these cases it was the mill line that was there first. Such crossings are generally controlled by the mill loco fireman changing the signals on the main line railway and holding down the catchpoints until the cane train passes. These diamond crossings are inherently dangerous and a maintenance problem for the government railway. The introduction (initially from Rockhampton south to Brisbane) of a 160 km/h "tilt train" on the government line makes them even less desirable. A "drawbridge" design of crossing has been introduced in a few locations, which can be automatically controlled, and consist of a section of 610mm gauge track which is lowered into position across the government tracks to enable the cane trains to pass. However, very heavy duty fabricated diamond crossings appear to be the favoured solution where grade level crossings are necessary. The future of rail transport in the Queensland sugar industry seems assured. In some areas, cane production is expanding, and with it the rail networks. The deregulation of the industry has ended the long-established system by which cane in a certain area was allocated to a certain mill, and production was restricted. While this has encouraged the expansion of cane growing and stimulated the building of new rail lines in some places, it has had some unfortunate effects. This includes the diversion to road transport of cane to a distant mill away from a closer mill to which it might have been able to be conveyed by rail. In addition, new pockets of cane growing are springing up in areas remote from rail transport. The burden on local government for infrastructure provision has certainly become a concern. Cane railways in the future will have fleets of 40-tonne locomotives and 10 to 20-tonne cane bins. Large battery locomotives will supplant diesels once a suitable battery technology is developed. Trains will run faster and there will be stricter and more effective methods of train control. In some areas new lines will be built as cane growing continues to expand, and money will be spent on easing grades and alignment to maximise loads. Track maintenance and even cane railway operation may be contracted out to specialised companies. Some smaller mills may close because of residential and tourism encroachment and a lack of land for expansion of cane growing to the levels necessary to support a 21st century sugar mill. Cane railways will continue to surprise and to interest, and they will remain "special" to the men who operate them, to the many visitors to the areas in which they run, and to those who simply love railways. This page written by John Browning for the LRRSA and copyright John Browning. Last updated on 30 July 2007..